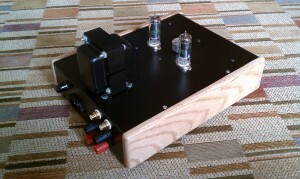 The Spud Kit is a complete two channel valve amplifier in kit form (or prebuilt). Using a single-ended pentode (6CL6 / 6197), the amp is capable of about 2 to 3 watts per channel into an 8 ohm load. The amplifier features a volume control and can be driven directly from a standard (2 volts or greater) line level output from your source. 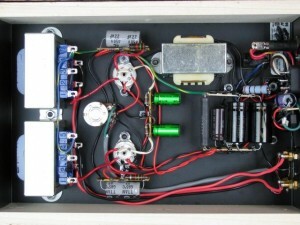 Included with the kit are all parts necessary to build the amplifier, a schematic and a complete tutorial on a USB thumb drive to assist new kit builders with this very simple project. The tutorial is geared towards the first time or inexperienced kit builder, but the project is fun for builders at all levels of experience. In addition to step-by-step instructions, the tutorial includes over 100 high resolution pictures of an actual Spud Kit being built. 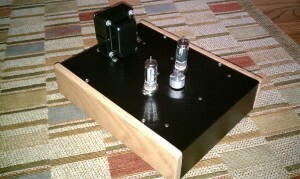 Once built, this amplifier will be happiest when mated with a pair of high efficiency speakers (92 db/w/m or higher depending on your listening levels). Many kit builders actually felt that the project was worth the price paid simply for the experience they gained and the pride they felt when they powered it up for the first time. However, the surprisingly detailed and accurate sound offered by the Spud Kit is the real source of continuing satisfaction. The Spud Kit excels at delivering the human voice in a clear and articulate manner. Additionally, many listeners have commented on the expansive sound stage and impressive separation of instruments. The Spud Kit is now available for most destinations worldwide. Shipping options for domestic and international orders are available (please note that the shipping charge for international orders includes a world voltage compatible power transformer). Although most kits are packaged and sent within days of your order being placed, please allow approximately two to four weeks for your kit to ship.